Keyword ssnotime35-There is no time limit. You can play this challenge and upload yourproject at Splitcoastand/or your Blog, anytime at all! You (and that means anyone and everyone, blogger or not! )can play as many times as you like!!! The point is to keep it simple, quick and have fun!!! Please link back here. The challenge this week is to create a trio of panels for your card. Your panels can be any size or shape, and you may put them on your card in any configuration at all — just get 3 panels on your card — that’s it!!! I love making pieces and then quickly putting them all together to form a card — and I love working in 3’s — so this challenge combines them both!!! Just have fun and, as always, try to keep it simple!! Check out Tammy Hershbergers sample here. This card is 5.5″ square and I use 6″ envelopes, so even though the top sentiment circle extends beyond the top of my card, it still fits in the envelope. My 3 white panels are cut 1.5 x 4.25″, and narrowly matted. My ties, from Menswear by Flourishes, are paper pieced onto Boxer paper by Basic Grey. That is the greatest paper for guys — just love it!!! The sheets look exactly like material for either cotton boxer shorts or silk ties — LOL!!! I decided to go with the silk ties for today!!!! The brads for tie tacks are SU. The Happy 60th Birthday was easily done using the JustRite D.I.Y Monogram Stamper (C-45). I used the Small Letters for the perimeter Happy Birthday and for the *th* on 60th, and I used the Medium/Large Numbers for the 60. After stamping it on white paper, it was then cut and embossed using my Circle Nestabilitiesand then matted. The sentiment could justas easily have said Happy Father’s Day on the perimeter with a larger DAD in the center — how fun!!! Stamps: Menswear by Flourishes; JustRite DIY Monogram Stamper (C-45), Small Letters, Medium/Large Numbers. Paper: White, Black, Boxer 6 x 6 pad by Basic Grey. Accessories: Circle Nestabilities by Spellbinders, Ticket Corner Punch (SU), Brads (SU). Thanks much, everyone, for stopping in hope you get time to play!!! Have a wonderful weekend!!! I will have to play sometime this weekend. Fun fun fun >”< I need more time in the day its midnight and I am still awake lol. I guess I can go pick up my card/paper mess, but that wouldn’t be fun. I will post back soon with my card. Have a great weekend! Very neat card, I just love that Boxer paper, it is so great for guys! Congrats on your big news, too! Yahoo! What a fun card, Sharon!!!! I knew I should have ordered this set. This would be perfect for my hubby’s Birthday. He is a tie fanatic :D.
Thanks for sharing your God given talent. Thanks for another fun challenge this week, Sharon! I love your sample with the cool ties complete with tie pins! Here is my attempt: I used three panels of DP for my background. Couldn’t be simpler! AWESOME AWESOME AWESOME!! What a GREAT men’s card!!! SO creative! I love the way you used the ticket punch. It looks like wall panelling! Perfect for the ties! Fun! 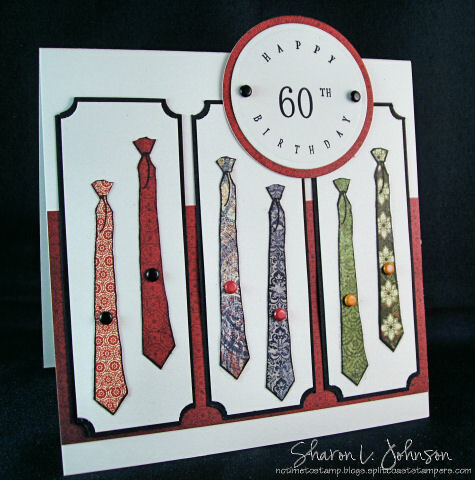 Sharon – another awesome card on your part. I love it! I have a card in my gallery that I love and it would be perfect for this challenge. Is there any way I could use it for the challenge, and if so, how do I go about that. I could upload it again but will that put it in my gallery twice? Thanks for sharing another very creative idea. Great challenge Sharon! Would have loved to see the boxers though! lol The ties will do for now. Great card! Now, how could you possibly know that I am going to my uncle’s 60th birthday bash tomorrow!?! Of course I don’t have that stamp and he’s a farmer so I don’t think he’s worn a tie since his wedding but I love the design – I am sure I can make it work with fish or something! Thanks for the inspiration! Thanks for posting this challenge. Hi Sharon, this is my first time at your blog, can you believe it?! Okay, Julia (artystamper) commented on my post today that I should use my card for your Friday challenge…so here I am! This is like 2 challenges in one week! You have no idea what a record that is for me since it’s only like the third one I’ve ever done! I am glad Julia sent me over here and I will be doin’ some browsin’! Have a great weekend! LOVE this card! Thanx for the constant source of inspiration! Your gorgeous is amazing! Love it! Those ties are just awesome! I played once again, love these challenges of yours! Thanks so much! LOL, typo queen here, I meant your CARD is amazing, but it is gorgeous too, lol! Here’s mine Sharon, fun and really fast challenge. I combined it with the IC for Saturday. I absolutely love panels like this on a card and this is so cool with the ties and the Just Rite element. A great looking guy card, Sharon! Love this Sharon! And you know the shirt and tie is one of my favorites! have seen! AND, the DP is perfect for the tie piecings! I am fairly new to doing challenges. I saw your card last night and admired it and enjoyed seeing your blog. So here I am playing today. Thanks for the challenge! What an awesome card Sharon! I love your paper pieced ties! Here is my take on your challenge! Sharon Love your card an your challenges. Here is my card on your challenge. So, who’s turning 60? Is their birthday today (May 17th)? My birthday is today, too, but I’m 61!!! Thanks for the cool challenge! I loved your sample. 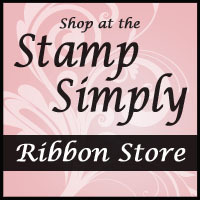 Mine is on my blog and on SCS here: http://www.splitcoaststampers.com/gallery/photo/916842 Have a great day!!! I have enjoyed your posts over the last week while I haven’t been able to get to my craft table. When I finally had some time last night I was so happy to find your challenge inspired me straight away. Fun one Sharon – my is truly ‘stamped simply’!! This is beautiful, Sharon. Love the little ‘th’ on 60th. Very cool. Love the new Lilac stamp set. A must have! Such a cool card Sharon!! Love what you did!! That card is just great! I love your work. I have posted a card for the challenge on my blog. Check it out!! finally put one together though.. I have added another one to my blog. I really enjoyed this challenge. Thanks for the inspiration. Thanks for always inspiring us Sharon!! Here is mine. I love using trios too! Here is my card for your, trio of Panel’s Challenge. I have used your panel challenge for inspiration. Hum, let’s just link to the card without the html. I feel so stupid. I went to SPLITCOASTSTAMPERS and uploaded my tri panel card and have no idea where it went! I started out by going to your tri panel contest, but when I clicked on UPLOAD at the top, it took me somewhere else. I am out of breath trying to figure out how to do all of this. I’m sure that your instructions are perfectly done, but for a pea-brain like me, it wasn’t enough. I had to have SueB take my hand and walk me to this point. I also went to SPLITCOASTSTAMPERS and uplinked my card, but it went to a site totally different from the one I intended. What! Don’t these sites read my mind?? Anyway, thanks to SueB, my card is at least visible at the above link. The papers on my card were all hand made by me so I can’t give any cudos to any company. The stamp is QUEEN ANN’S LACE from A1Stamps and was done with VersaMark and embossed white. Thank you SO much for doing the work for me where uploading my card (to the correct place) is concerned. My card is the absolutely worst one of the bunch but at least it’s THERE!